With the arrival of 2014 New Year, the Valentine's Day is getting closer and closer. There are several versions of the origin of Valentine's Day, one of which is to say in the third century AD, the Roman tyrant prohibit weddings in order to recruit more soldiers, a monk named Valentine Valentine ignore the ban, he secret help people presided over the wedding, so he was imprisoned, and finally death. And the day that he died on February 14, in order to commemorate the spirit of Valentine's courageous, the day February 14 as Valentine's Day, thus became later "Valentine's Day." On this day, some people will give Valentine gifts to lover or favorite people, such as chocolates, cards and flowers. But in recent years, Valentine?? ?s Day alleged too "commercial." Do you have other better gift ideas in addition to chocolates, cards and flowers? How about create digital Valentine photos flash magazine for your beloved? Follow this article to create flash digital Valentine flash magazine. 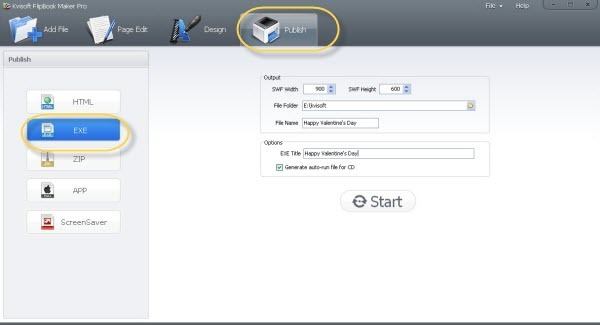 Download flash magazine software Kvisoft Flipbook Maker Pro. And install it on your computer. Select some photos that can record the memorial segment during lovers, or some videos, SWF segments. Here i use some cute animated valentine pictures, and two SWF files to complete my Valentine flash magazine sample. Step 2: Start making flash Valentine magazine. Open the magazine software, import all your files. 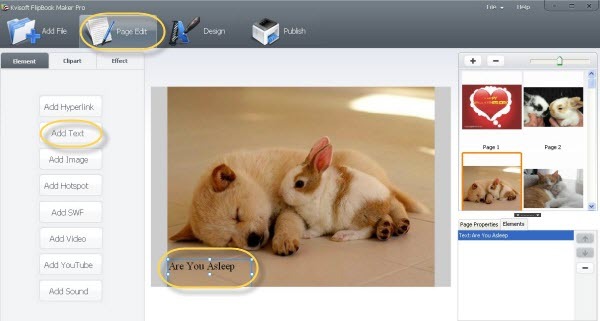 Drag and drop the files to change their positions according to your need. Then click the Page Edit button to do editing. Click the page where you want to add videos or text, you can add sweet love words for each photo, just click the Add Text button, then drag a frame on the right work Windows, an Add Text Windows will pop up, write down your words and then set font, color size, etc of the words. After finish editing each page, please go to Design tab. 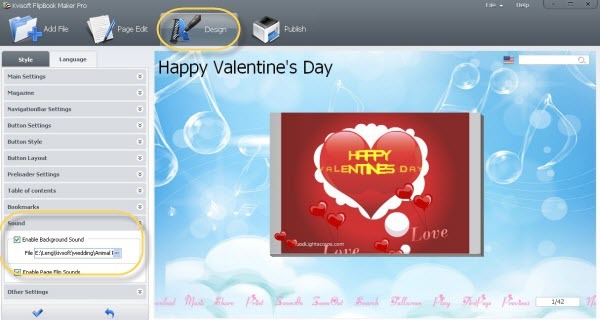 Under this work Windows, you can choose a background Valentine template for the magazine. And then go to advanced setting to do more creative settings. From Main Settings option, you can write the name of the magazine such as Happy Valentine?? ?s Day, and set style of title. From Button Settings option, you can set the navigation buttons number such as display share button on the navigation bar, or disable Search box, etc. Go to Sound option, you can add a background music song. Step 3: Complete flash Valentine magazine. Click the publish menu from the top. As for personally use, you can publish as EXE format, the exe program can automatically run on computer without any other assistances. Then click the start button to complete the job. Here is my Valentine Flash magazine sample (https://www.dropbox.com/s/mp9i4awz26qz4hg/Valentine's Day.exe) that I publish as EXE format, I share it on Dropbox. You can download to preview.